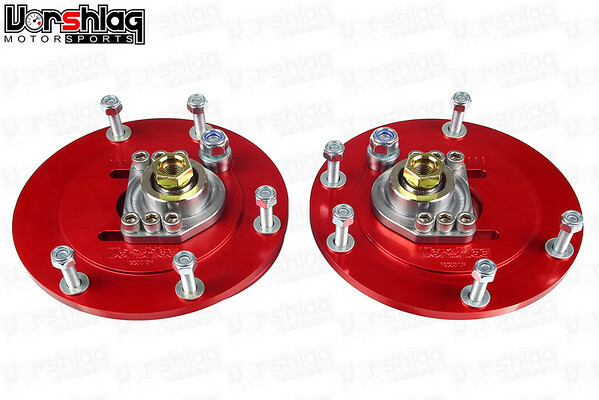 CAMBER PLATES : We highly recommend Vorshlag camber plates be used with Ohlins strut kits, but the shocks can be used with the OEM upper strut mount for racers on an extreme budget and/or where class rules do not allow an upper camber plate. Easily adjust camber track side to get much more negative camber with this option. Over-sized spherical bearings are designed to withstand the rigors of street and track abuse. All components are plated for maximum corrosion resistance and long life. Please see the product entry on this website for more information about the Vorshlag camber plates and perches. Ordering this option includes the associated Vorshlag upper spring perches made to work with these plates.